Almost the first publican was Yorkshireman Joseph Brownhill, who was at the helm from 1873 until his death in 1891, when, in a common pattern for publicans, his wife Fanny took over. Brownhill had previously been licensee at the Norfolk Hotel in Easey Street. 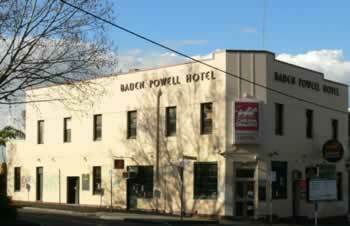 The name of this hotel was changed in 1900 to commemorate Robert Baden-Powell. During the Second Boer War, Baden-Powell became a national hero for his role in the Siege of Mafeking, 1899-1900, the most famous British action in the Second Boer War. The hotel was renovated again in 2008-2009; with the exception of enlarged ground floor windows, the exterior has not greatly changed.